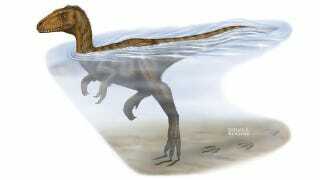 New evidence from the University of Alberta suggests that some terrestrial dinosaurs, including carnivorous theropods, were very capable swimmers. Canadian paleontologist Scott Persons recently examined fossilized claw marks he found on a river bottom in China's Szechuan Province. The scratches, which were left by two-legged dinosaurs, extended for distances of nearly 50 feet (15 meters), indicating a co-ordinated left-right, left-right progressive motion. Due to the shallow cuts in the river bottom, the dinosaurs were likely walking on the tips of their toes as they waded through 3 feet (1 meter) of water at the hip. Working with fellow U of A grad student Lida Xing and a team of international researchers, Persons found paddling marks left by what he suspects was an early tyrannosaur, or feathered Sinocalliopteryx, a carnivorous predator that existed in that part of China more than 100 million years ago. The claw marks were found beside the fossilized footprints of giant herbivorous long-neck sauropods and ornithopods, all from the Cretaceous era. Dinosaurs likely navigated across the river in periods when the water was high, rather than taking a leisurely dip. Their bodies contained air sacks, equipping them with built-in flotation devices. “They were actually quite buoyant,” Persons said. What was surprising to the scientists was not that some dinosaurs could swim, but that they could swim for such long distances. The study was published in the journal Chinese Science Bulletin. Image: Nathan E. Rogers via University of Alberta.